Having given two lectures in a week that featured a long, detailed analysis of the creative class, it was perhaps with a little bit of cosmic timing that I came across this article that same week in The New Republic, on the ‘real’ problems of gentrification. The process of gentrification (and all it’s subsequent ‘real’ problems, more on that later) is obviously mechanistically linked to the inward migration of the ‘creative class’ into any given area of the city – which is essentially any of those places that are ‘cool’ and ‘bohemian’ this week (which is, now, apparently, it would seem, the suburbs). On first reading of the New Republic article, the genuflection to Jacobs and her ideals rang true enough, the championing of street culture and the lamentation of homogenized urban development is clearly in the vein of the much lauded Jacobsian urbanism. However, while it was commendable that the article was highlighting the ‘sterility’ of contemporary urban aesthetics, this is where it’s derision toward gentrification was focused – this, the article claimed, is the ‘real’ problem of gentrification. But is it? Is the only issue we have with the constant ascension of rental costs, the displacement of long-term residents, deleteriousness of community and short-termism in property development that it creates homogenous places? Such an argument, particularly rooted in a Jacobsian ethos of people-focused urbanism, seems rather counter-intuitive. Engendering the spirit of Jacobs requires a certain viewpoint, one that cherishes the urban population for what it is (or at least was) – diverse, mixed, chaotic and differentiated. The ballet of the street that Jacobs describes is predicated upon all the extremes of social life, across as many axis as you care to mention, living together, side by side. Rich and poor, black and white, young and old, left and right, male and female (and so on and so on and so on…) – put them altogether in the same area and you get the most ‘livable’ urban places you could ever imagine – not livable in this rather formulaic, hawkish sense, but livable in that it is where you experience the best and worst of each other’s lives. So, by focusing on the the aesthetic problem of gentrification, the mantra that The New Republic article purports (which is a more widely held belief among many urban thinkers) relegates the other more social problems to a realm outside of the main drivers of urban redevelopment, namely the real estate-led urban growth machine. Extreme urban poverty, underemployment, homelessness – these issues are part of the fabric of any given urban area (well, at least those areas that are oft identified in need of regeneration), yet their tackling remains largely absent from the latest brochure for housing project X or media city Y (or if it is in there, it seems skin deep – lip-service to a social agenda that is low down on national and local policy priorities). In other words, many of the vocal reactionaries of the homogenizing aesthetic are missing a more damaging issue for cities – the homogenization of the people who live there. Many of the large number of housing redevelopment schemes going on around in the UK for example are vitriolic toward existing housing projects, but the forwarded action is a simple destroy-and-replace exercise. This does little more than provide lucrative contracts to property developers, something which characterised the growth of the post-war housing effort in the first place (outlined very well in Inquiry – Adam Curtis’ 1984 documentary). Robin Hood Gardens, with it’s future looming in the background…? 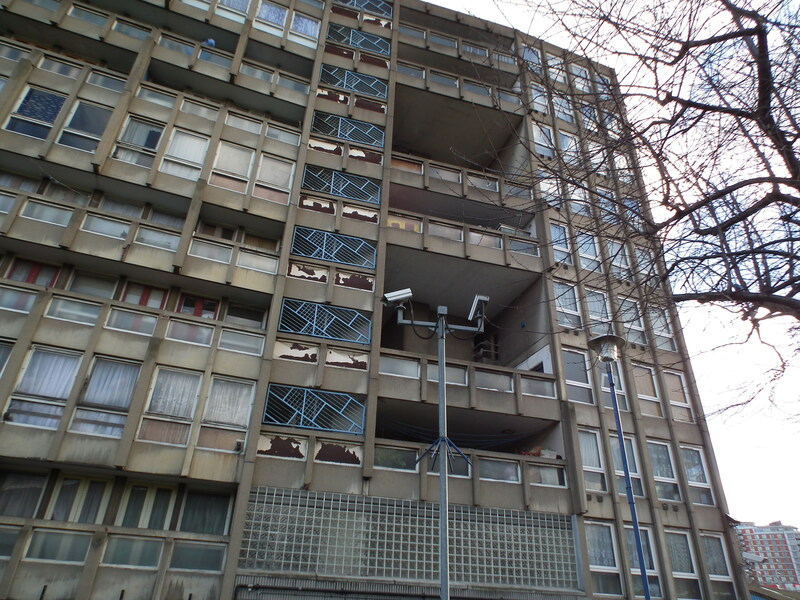 Take Robin Hood Gardens in East London for example – a low income housing estate earmarked for demolition. 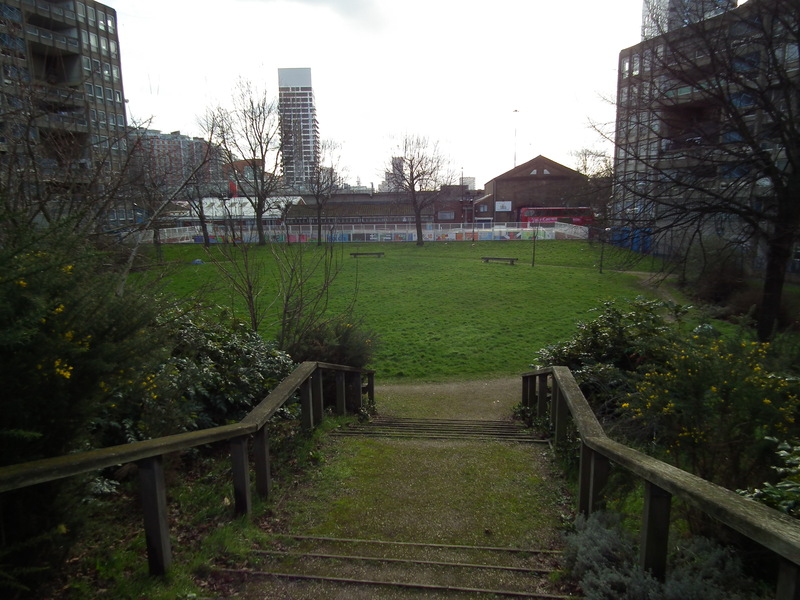 Against local opposition, the council (backed by private investors) and the national government successfully argued against granting it Listed status, thereby effectively green lighting the redevelopment scheme, Blackwall Reach. Yes, the new scheme will contain social housing, but this in itself can be a red herring, and is often a byword for shard ownership or just smaller accommodation. Yes, it is poorly designed and makes for difficult living conditions, but it does have a sense of community, that would not, I would hazard to guess, be replaced by new developments. The proposed redevelopment and construction of Blackwall Reach does seem a little bit like throwing the baby out with the bath water – what is wrong with using the vast millions to upgrade the existing structure instead? It would take longer yes, and may be more difficult to achieve, but building on what’s good about Robin Hood Gardens and fixing what’s bad seems an infinitely more desirable and sensible idea than starting from scratch, doesn’t it? But then, that’s not what politicians seeking re-election and shareholders wanting a quick return want to hear. So, the constant cyclical redevelopment (creative destruction) of our cities continues. Gentrification of specific places, further displaces those who can’t afford to live there and hence, further increases the unequal geographies of the city. It creates further enclaves of the middle (or creative?) class, and robs those who can’t afford to stay of their community ethos built up over the years of residence. This ghettoization of the city can’t be good. Heterophillic networks, as I have said before, are important for maintaining whatever ‘it’ is that keeps us as individuals aware of exterior sensibilities. And so, by having a healthy mix of all different kinds of people, as Jacobs suggests, is more than a nod to political correctness – it is a vital ingredient of thriving urban areas. Gentrification, as has been fantastically articulated metonymically through Haunted House films in this article (thanks to Tom Slater for the link), fails to maintain this heterophillic diversity – I suppose that’s why it’s called gentrification. And that, above all else, is it’s real problem.